Floating Planet was founded by psytrance producer and guitarist Vladimir ‘Hubert’ Adamek AKA Chors and bass guitarist Marian ‘Barney’ Bartoska, both natives of Slovakia, who mix the sounds of guitar, bass guitar, and electronic music. After two years of studio work they were joined by third member, drummer Pavol ‘Paulo’ Jambor, to reshape their studio project into a full-fledged live band. The results could be described as a eclectic fusion of chill out and energetic downbeat further influenced by elements borrowed from ambient, dub, nu-jazz, and trip hop. 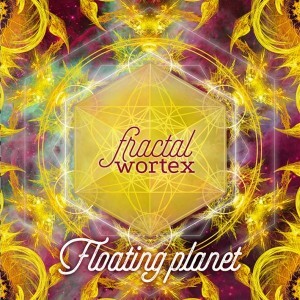 Now, after two years of live performances and experiments, Floating Planet release Fractal Wortex to showcase their organic downbeat style to the world. Mastered by Colin Bennun at Stoodio Mastering with artwork by Alienjedna, Czech Republic. MP3 Download | FLAC Download | WAV Download · Download count: 8,261. Something fresh! Loving the live band’s addition to the psychedelic music, the feeling of every instrument is great. Amazing pleasure & bliss for your ears! Am I the only one that cringes when guitars and other ‘real’ instruments are combined with electronic (except Shpongle of course)? But this here was very tasteful and well crafted, I have to admit. Album of the year no doubt. Fantastic potential for more to come, keep it up and add some hanging drums and vocals. Is there a link to see them perform live? WOOOOOWWWW, true masterpiece !!! One of the best chill stuff I heard in a long time ! Neverím, narazil som tu na slovenských interpretov?